Biryani and I have a bit of a history. Growing up, I abhorred any food that contained whole spices. Cloves, peppercorns, coriander seeds, you name it. Just the sight of them in my food would be enough to make me nauseous. This made eating biryani quite the struggle. I was the only Pakistani child I knew of who didn't like biryani. Not liking biryani in the desi community is more than enough to get you ostracized. It's practically considered sacrilege. Over the years I learned how to stealthily pass up biryani at desi gatherings and people learned to like me regardless. I thought I had finally escaped the curse of biryani until I met my husband. I quickly discovered that he like most Desis loved his biryani. Actually, it's his all time favorite food. I could no longer ignore it, in fact I would have to learn how to make it. I thought if I do have to make biryani I should do it in a way that would appeal to both my husband and I. I left out the whole spices and replaced them with other flavors I could tolerate. Regardless, my first attempt was not pretty. It was a gooey, yogurty, bland mess. My poor husband ate it anyway and that was the moment I knew I had married a saint. Fast forward to around a year later and I've slowly gotten my biryani recipe down. It's a bit different from the traditional variety but it's a crowd pleaser none the less. I infuse it with lots of fresh herbs, lemon, and chilies which create an incredible aroma and taste. 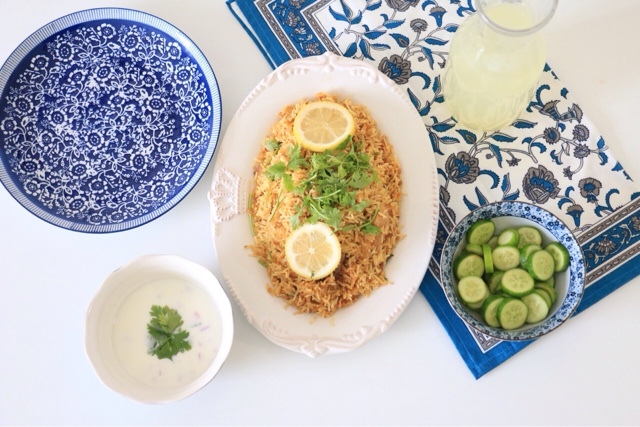 I always serve biryani with a bowl of fresh raita (a yogurt sauce) which compliments the spicy rice perfectly. I make my biryani with chicken but it can easily be made into a vegetable biryani by replacing the chicken with any veggies of your choice. Here's my step by step biryani guide. This recipe generously feeds 2 people. 1. Soak 1.5 cups of Basmati rice in water for 30 minutes. 2. Drain the water and boil your rice. Make sure you salt the water generously and add in around two tablespoons of vegetable oil to keep your rice from sticking. 3. After your rice has cooked to the point where it is soft but still not cooked through all of the way remove it from the heat and drain it in a colander. Set your rice aside and let it cool. 4. Now it's time to prepare your chicken mixture. In a large pot fry 3 - 4 medium sized onions until they are golden brown. Add in 1 heaping tablespoon of ginger garlic paste and fry some more. 5. Add in your chicken and fry it with the onions until the chicken changes color and becomes white. 6. Slice 1 - 2 medium sized tomatoes and add it into your pot along with 2 - 3 green chillies. Cover with a lid and let the mixture cook on low heat for a few minutes until the tomatoes get very soft. 7. Mix your yogurt and spices in a separate bowl and add them to the chicken mixture. Make sure the heat is low or otherwise your yogurt will curdle. 8. Once your yogurt has mixed with the chicken add around 1 cup of water and let it cook until the sauce in the chicken mixture becomes thick. 9. Once your chicken mixture has finished cooking add in a handful of chopped coriander, 3 - 4 slices of lemon, and a few green chilies along with your rice. 10. Cover with a lid and set the heat to medium. Let the mixture steam for 15 - 20 minutes. There it is, your biryani is ready to serve!